The Institute of Molecular Biology gGmbH (IMB) is a Centre of Excellence for Life Sciences funded by the Boehringer Ingelheim Foundation and located within the campus of the University of Mainz in Germany. IMB focuses on epigenetics, DNA repair and developmental biology and offers premium scientific core facilities (see www.imb-mainz.de/core-facilities ). 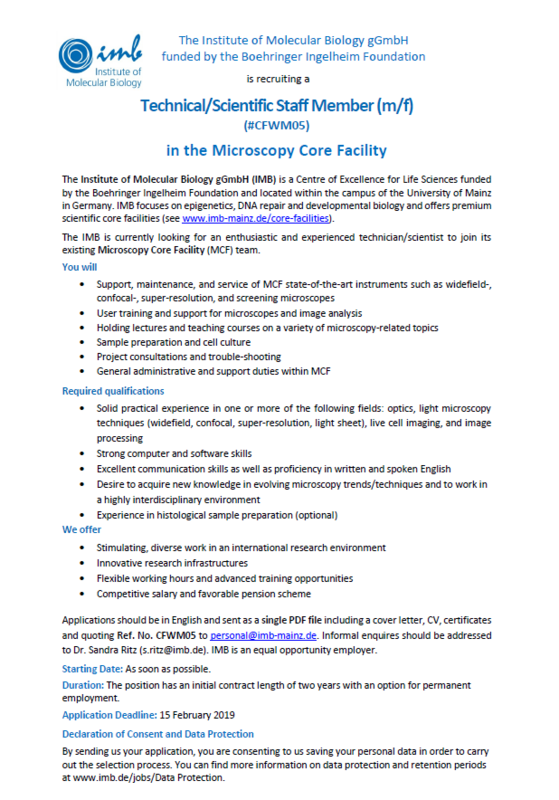 The IMB is currently looking for an enthusiastic and experienced technician/scientist to join its existing Microscopy Core Facility (MCF) team.